Whilst in Washington, I met up with a lovely lady called Gilda Haber who grew up in Bethnal Green, in the East-End of London, where coincidentally my Father also grew up. She however now resides in DC. Gilda has written a short story which has recently been published, called Mourning Becomes Electra, in which Steed Features. The story revolves around Gilda herself, a hat designer and maker by trade (Hats By Haber) and a Widow named Mrs. Knox, who came to her for an Elegant Black Satin or Silk Hat for her late Husband's Funeral. Steed is mentioned in the section of the story below, where the latest husband of Mrs Knox visits her for a hat of his own and Gilda notices the Steed label. "I seized his jacket and read the bespoke tailor’s name embroidered inside the inner right breast pocket, “Steed of Savile Row.” Every good tailor kept a list of his clients. Even if he’d altered his name, I knew his unusual suit color and fabric. " "Tomorrow, I would call Steed in London. I now turned and held up his jacket, the softest blend of wool and cashmere, delicious to the touch. $1,800 a meter, a Prince’s raiment, and helped him slide his arms into it." 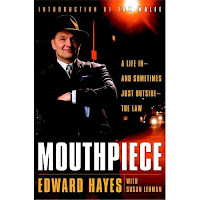 Steed has also been mentioned in Ed Hayes' book, Mouthpiece, as one of his tailors. Maybe one day we will be mentioned as 007's favourite tailor?